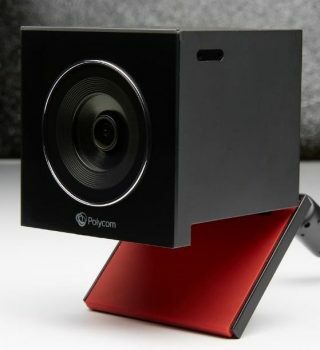 The Poly EagleEye Cube is an advanced HD Video Conferencing camera with intelligent framing and a 5x zoom, providing small meeting rooms and huddle spaces with a flexible, high quality solution for collaborative meetings. More than half of what we convey is based on body language, such as eye contact, posture, and facial expressions. Being able to see and hear all meeting participants clearly ensures that meaning is clear, and collaboration is more productive because people are more attentive and engaged. Poly is known for enhancing communications in business environments. Whether you use the two built-in microphones with crystal-clear pickup or integrate audio with Poly RealPresence Group Series or Poly Trio-led rooms, no word will go unheard. The combination of video and voice provides an entirely new perspective for small group meetings to fuel collaboration. The Poly EagleEye Cube camera can simply be managed via the Poly Trio or Poly RealPresence Group series it is connected to, for in room management, or by utilising the Poly Device Management Service (PDMS-E) to manage all devices across your network. The Poly EagleEye Cube can be installed in minutes with minimal technical knowledge. The most common deployment is with a Poly Trio and VisualPro or with RealPresence Group Series. What Solutions use the Poly EagleEye Cube? For Microsoft Teams and other Microsoft UC Environments, VideoCentric use the Cube within a number of bundles to enable personal users of Teams to excel their meeting room experience. The Cube can be used with the Trio and other USB solutions to create a high quality meeting room experience for organisations with a flexible BYOD policy; speak to us today to discuss your USB and Microsoft Teams needs, or to find out more about the Poly EagleEye Cube.